The Finnish composer Kalevi Aho and his younger colleague and compatriot Sebastian Fagerlund have both received international recognition for their masterful treatment of large orchestral forces. This they have demonstrated in purely orchestral as well as in concertante works � Aho has written 26 concertos to date (most of them in his monumental project to compose a concerto for each of the main orchestral instruments), and Fagerlund�s concertos for clarinet and for violin have been released by BIS to critical acclaim. On this disc the two composers appear side-by-side with their respective concertos for bassoon and orchestra, works that to a certain extent illustrate different approaches to the concerto genre. 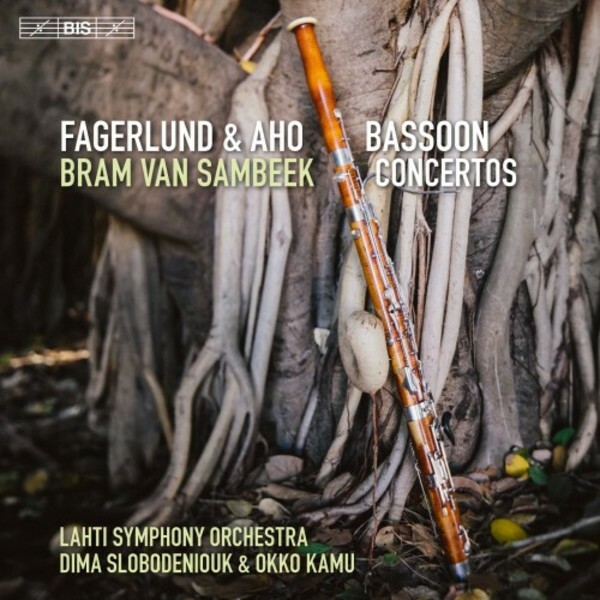 If the Romantic concept of the concerto was that of a struggle between the soloist and orchestra, Fagerlund in his Mana (2014) instead gives the bassoon the role of a spiritual leader, conjuring up new sound worlds from the orchestra. (In Swedish � Fagerlund�s mother tongue � �mana� is a verb that suggests invocation; in Finnish the word alludes to exorcism). Kalevi Aho, on the other hand, has endeavoured to enrich and expand the solo instrument�s sonic and expressive possibilities through his use of orchestration and describes his concerto as �quite symphonic in character�. Soloist in both works is Bram van Sambeek, the first bassoonist ever to receive the prestigious Dutch Music Prize and the musician for whom Fagerlund composed Mana as well as the solo piece Woodlands, written in preparation for the concerto. Kalevi Aho also contributes a substantial and dramatic solo piece, Solo V, which makes use of multiphonics as well as microintervals.